So yesterday was totally one of those days that it felt like nothing could go right. It started off with me accidentally burning one of my photography backgrounds. Yep, a nice ring of burn mark. Kind of like a coffee stain that I can’t wipe up but bigger. It was one of those days that gets me down, but hopefully today will turn it all around and I’ll nail a new version of that cake (and figure out a solution to my burn mark). 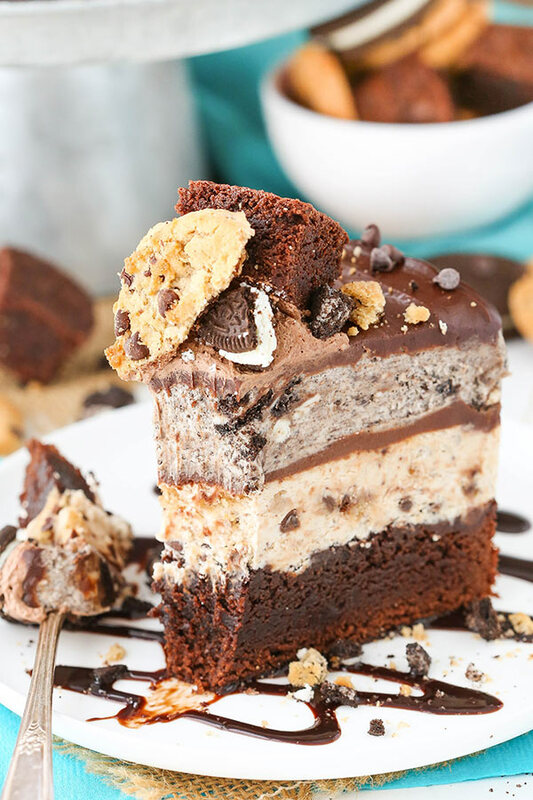 Certainly today is at least a little bit better because I’m sharing this ice cream cake – and I’ve been so excited to share it with you! Oreo brookie is basically one of the best flavor combos out there, let’s be real. 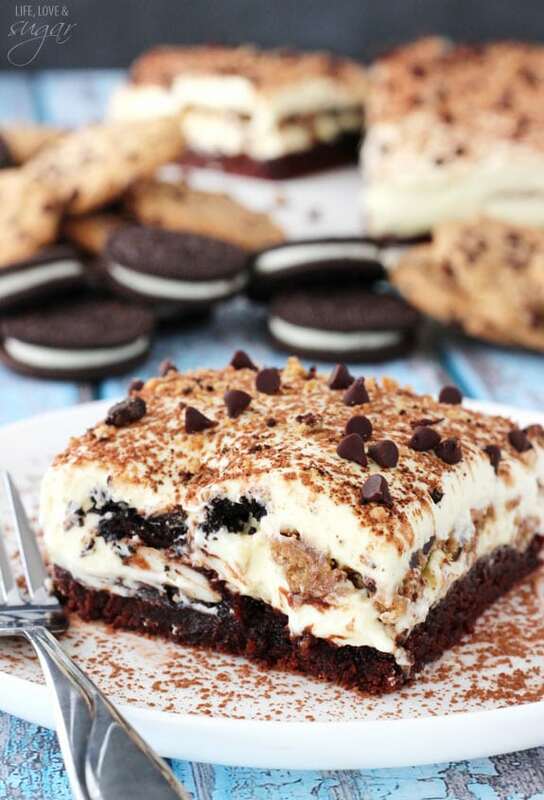 Brownies + chocolate chip cookies + Oreos = everything that’s good in life and dessert. 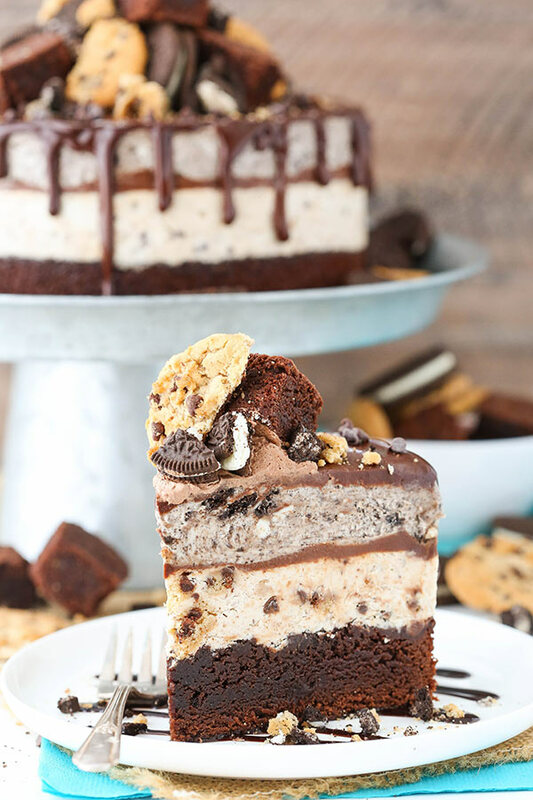 Between my Oreo Brookie Layer Cake, Oreo Brookie Tiramisu and now this ice cream cake, there are so many fun ways to enjoy it. And this one is perfect for summer! It starts with a brownie on the bottom. I used a box mix just to keep it simple, but feel free to use this brownie from scratch if you like. It might not be quite as thick as the box, but it’d still be great. On top of that is no churn ice cream filled with chocolate chip cookie crumbs, chopped cookies and mini chocolate chips. SO good! 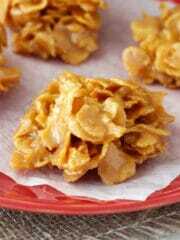 To get the crumbs I just popped some crunchy cookies into a food processor and let it grind ’em up! 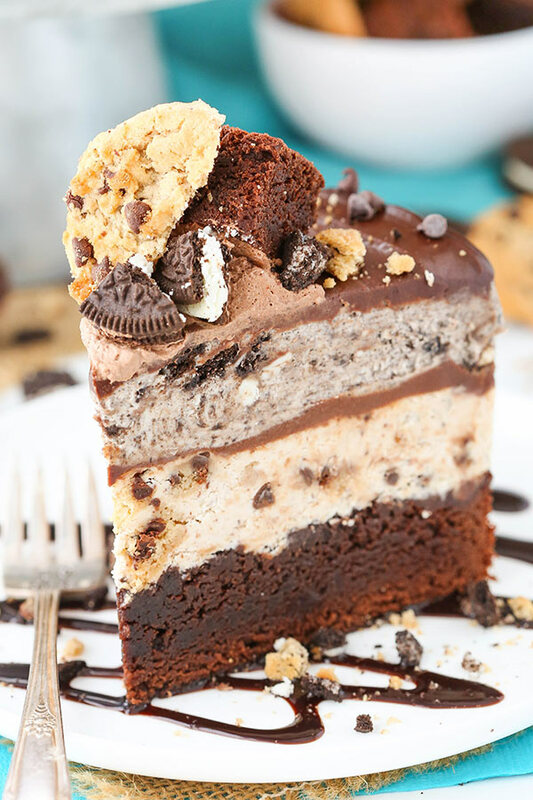 Next is a layer of chocolate ganache topped with no churn Oreo ice cream full of Oreo crumbs and chopped Oreos. Love it! The no churn ice cream is super easy to make, with a primary base of cream cheese and whipped cream. Once made, divide it into two bowls and add your cookies! I layered everything with a cake collar because I find it to be the easiest to work with. You could also build the cake inside a cake pan (more on that in the instructions below). Once built, you’ll want to freeze the cake. I usually let it sit overnight. 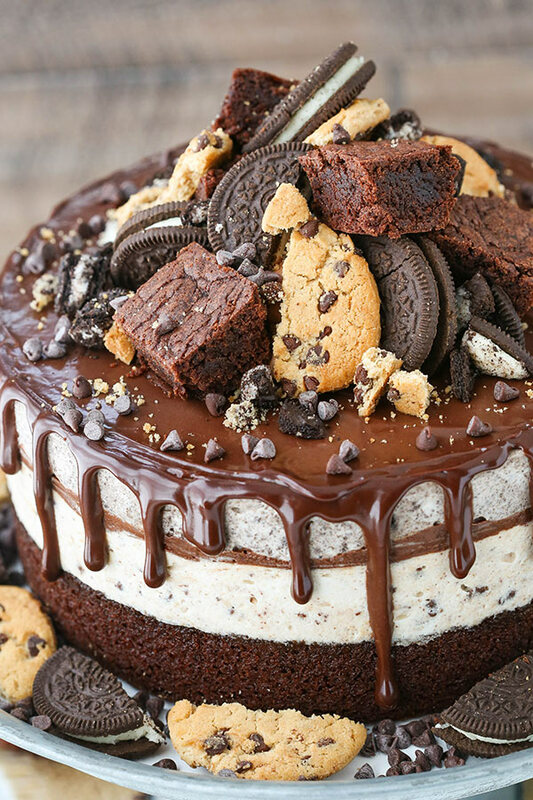 To decorate it, there’s more chocolate ganache drizzled down the sides and chocolate whipped cream topped with more brownies, chocolate chip cookies and Oreos. I bought the brownies on top at the store just to make it easy, but you could make those too if you want. 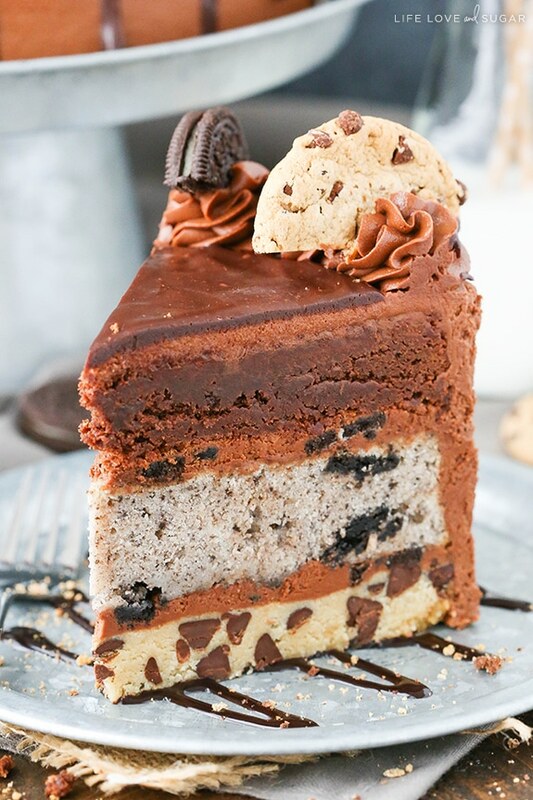 This cake is seriously heavenly! 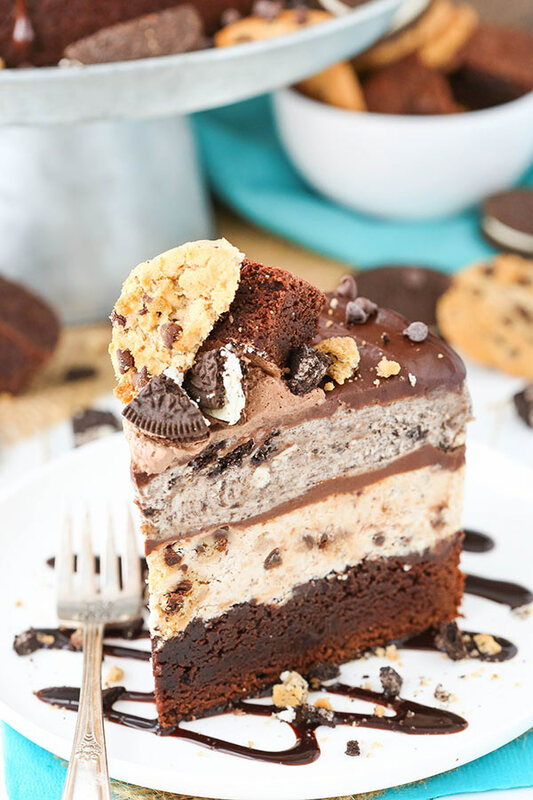 So much chocolate and cookie and Oreo flavor – I couldn’t get enough! It’s a dangerous cake that is totally work every bite! NOTE: 8×3-inch springform pans are ideal for building this cake so that you can easily remove the cake once it’s been assembled. If you do not have a springform pan, line your cake pan with clear wrap before adding your parchment paper and cake board. You can use the clear wrap to lift your cake out of the pan once it’s assembled and frozen. 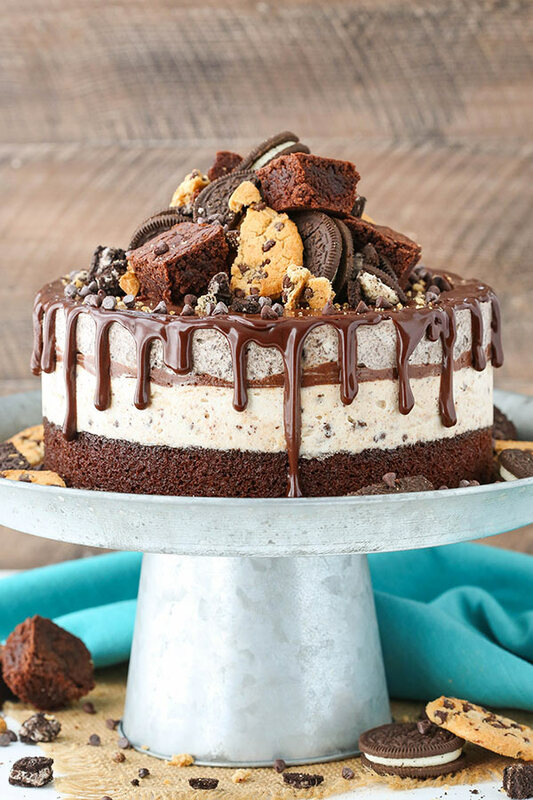 You want to make your cake layers in the same pan you’ll use for layering the ice cream and cake together so that the cake layers fit in the final pan you use for layering. In lou of using a cake pan to build the cake, you could also use cake collars as I did. 1. Grease an 8-inch cake pan (preferably springform pan, see above) and line the bottom with parchment paper to allow for easy removal. 2. Make brownie batter according to instructions on back of box and bake in the 8 inch pan. 3. When brownie is done baking, allow to completely cool. 10. When the brownie is cool, make the ice cream. In a large mixer bowl, combine the cream cheese, sugar and brown sugar and mix until smooth. 11. Add the milk and vanilla extract and mix until smooth. Set aside. 12. In another mixer bowl, add the heavy whipping cream and powdered sugar and whip on high speed until stiff peaks form. 13. Gently fold about 1/3 of the whipped cream into the cream cheese mixture until combined, then fold in the remaining whipped cream. 14. Divide the ice cream mixture evenly between two bowls. 15. To one bowl, add the cookie crumbs, chopped cookies and mini chocolate chips. Fold to combine. Set aside. 15. To the other bowl, add the oreo crumbs and chopped oreos. Fold to combine. Set aside. 16. Make the chocolate ganache. Add 3 oz of the chocolate chips to a small bowl. 17. Heat 1/4 cup of the heavy whipping cream until it begins to boil, then pour it over the chocolate chips. Allow the mixture to sit for 3-4 minutes, then whisk until smooth. Set aside. 18. 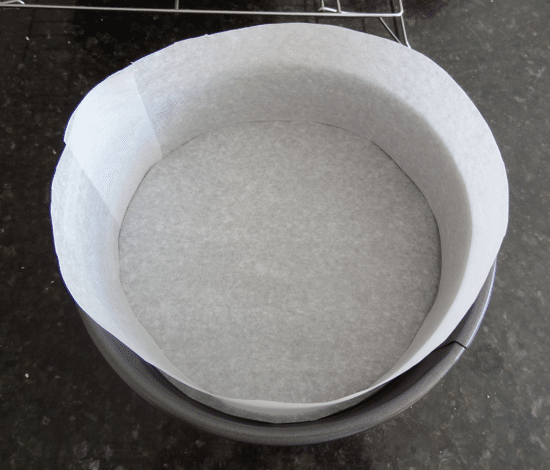 If you are using a cake pan to build the cake, line the sides of an 8-inch springform pan with parchment paper. The parchment paper should stick up above the top edge of the pan, since the cake will probably be a little taller than your pan (see example). If you want, put a cardboard cake circle in the bottom of the pan. If not using a springform pan, you pan put some plastic wrap in the bottom of the pan and up the sides and use it to lift the cake out of the pan when it’s done. If you are using a cake collar, wrap it around the brownie and secure in place. 19. 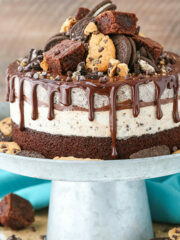 Add the cookie ice cream to the top of the brownie and spread into an even layer. 20. Add the chocolate ganache and spread into an even layer. 21. Add the oreo ice cream to the top of the ganache and spread into an even layer. 22. Freeze the cake for 6-8 hours or overnight. Once frozen, remove from springform pan and remove parchment paper from sides. If you used a cake collar, remove it. 23. Make the chocolate ganache. Add 6 oz of the chocolate chips to a small bowl. 24. Heat 1/2 cup of the heavy whipping cream until it begins to boil, then pour it over the chocolate chips. Allow the mixture to sit for 3-4 minutes, then whisk until smooth. Set aside. 25. To make the chocolate whipped cream, add the heavy whipping cream, powdered sugar and cocoa powder to a large mixer bowl. Whip on high speed until stiff peaks form. 26. Drizzle the ganache around the edge of the cake. I use a squeeze bottle, but you could also use a spoon. 27. Fill in the top of the cake and smooth with an offset spatula. 28. Pipe a small dome of whipped cream into the center of the cake. Decorated the top of the cake with additional brownies, oreos and chocolate chip cookies. 29. Place cake in the freezer until ready to serve. Cake is best stored covered for 4-6 days. Ohooo ! 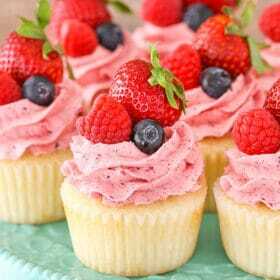 It looks seriously delicious ! Chocolate and oreo ice cream, I love it, in fact most of the people love it. Thanks Lindsay for the recipe. 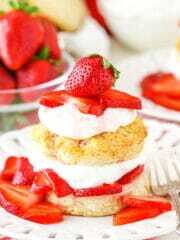 Hi, when I have to serve it, should the cake stand at room temperature?? It can. It’ll be easier to cut if you let it sit for about 30 minutes or so. This looks so good!!! I loved the cake version so I am very excited about this ice cream cake!! Quick question, in step #20, it says to add 1/3 of the chocolate ganahce but doesn’t say when to use the other 2/3 of it. By the looks of the video, it seems that you use the entire 3oz of chocolate ganache for step #20 instead of just 1/3 of it – is that correct? You are correct – you add the full 3 oz. Thanks for letting me know – it’s been updated. 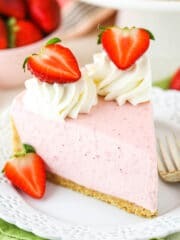 A friend of mines sent me this cake recipe to make for her this weekend ! 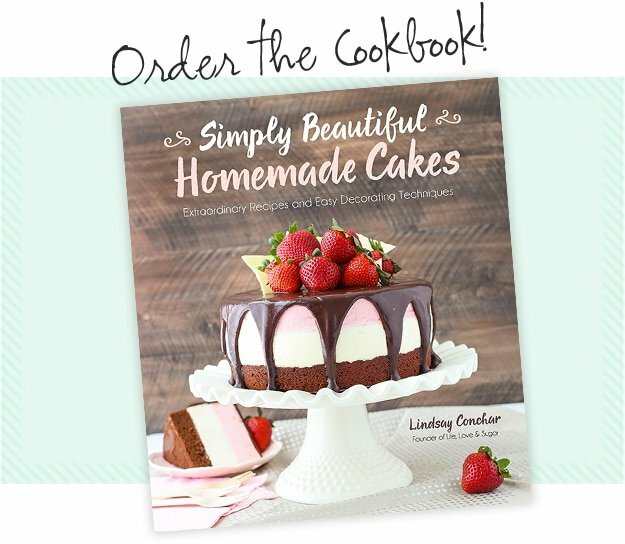 , She wants Icing around the cake , what type of flavor icing would you recommend for this cake ? Thanks in advance ! I would suggest the chocolate whipped cream that I used on this ice cream cake. For the no churn ice cream, why does it require cream cheese? Does the ice cream melt easily? How do you make the ganache drip using a spoon? Sorry for bombarding you with questions. I hope you don’t mind. Cream cheese is just part of the base I use. Some people use sweetened condensed milk, but it’s thinner and doesn’t layer as well. The ice cream doesn’t melt as easily as regular ice cream. You can find a video with me using a spoon for the ganache in this post. I made this for my daughter’s 20th birthday today and it was a major hit! 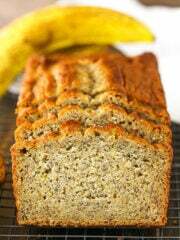 I was a little worried when she picked this out, but it’s a wonderfully written recipe! Thanks so much for sharing and making my daughter’s birthday extra special! Wonderful to hear! So glad you enjoyed it! IFirat, thank you for bringing this into my life!! It looks amazing!! I’m making this for my son’s birthday this weekend. Have you ever tried using regular ice cream instead of making your own? I thought that as long as it was soft enough it could be layered similarly but without the trouble of making my own. Will this cause the ice cream to melt too quickly and turn the cake to mush? Because that would be heartbreaking!! Oh boy, if I wasn’t on a healthy diet, I would be munching on this one every night. I’ll still make this one next weekend for my brother’s birthday, such a good find! Thanks Lindsay! Also, this is my first time on this amazing blog!! I hope you enjoy it! Thanks Melissa! Is there anything I need to do differently if I want to make the brownies in a 9″ springform pan? Also, do you recommend soft or crispy cookies? I was thinking soft (like entenmenn’s) but not sure if that wouldn’t be as good. Please let me know! 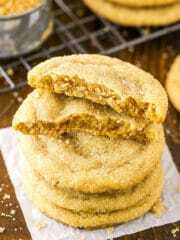 Planning to make this for my hubby’s birthday but I also want to add a layer of actual cookie that I plan to bake in the same 9″ pan. 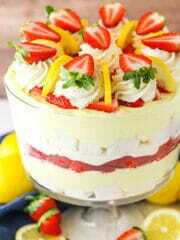 Hey Lindsay, This cake is so pure indulgence. I can’t imagine if it’s on my plate and I get to taste it. Very amazing picture. 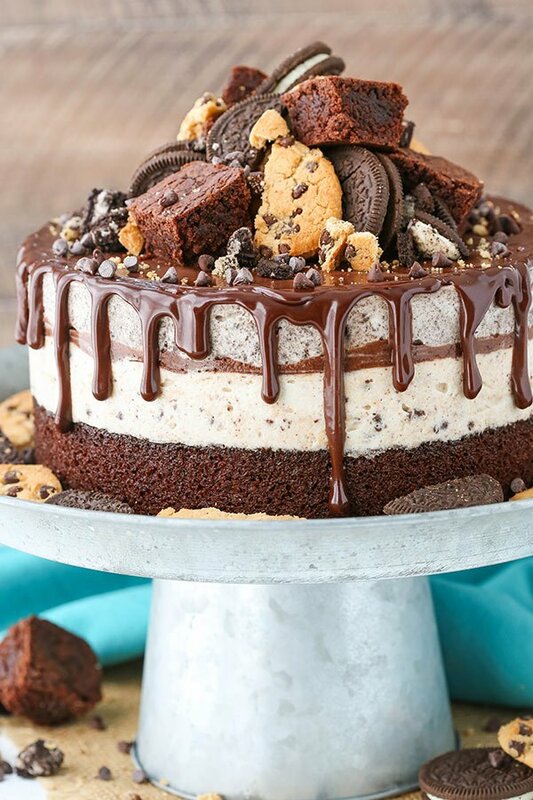 When assembling the cake in a spring form pan, do I leave the brown cake in the bottom and build on top or do I take it out and build the ice cream part and stack it later? You leave the brownie in the bottom and build the ice cream layers on top of it. 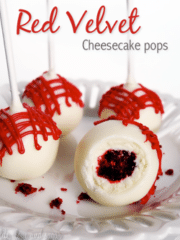 Amazing recipe and I am going to make this tomorrow night!! Silly question – once it is assembled and frozen 6-8 hours will the brownie base be frozen rock hard? I don’t see this defrosting in time to be a “brownie” texture ?? I don’t find the brownie to be too hard. It certainly is firm, but I’ve used them in ice cream cakes many times. Yep turned out totally fine! Thank you! Soud I put the cake, when its ready, in the refrigerator or in the freeze? Greetings from Russia. I made this cake for my son’s birthday. We celebrated it on December 31. We all liked him very much. Thanks for the great recipe. I sent it to my friends from Russia. We all liked him very much. Oh my!! This looks like a mountain of deliciousness!! CAN someone pass me a tissue? I think I’m drooling!! Do I use ingredients for “cake like brownies” or regular that are on the box. Thanks! I usually just make regular brownies. 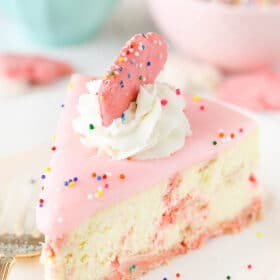 Hi there, I’m planning on making this for Easter but don’t have a bunch of time the day of or day before. How long in advance could I make this and keep in the freezer? It should be fine for up to a week, if well covered. 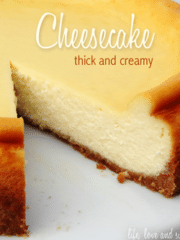 This isn’t the best recipe, the ice cream is more of a frozen, very heavy thick, cheesecake texture. The brownie freezes so solidly you can’t even cut through it, and by the time it defrosts to be able to cut through the ‘ice cream’ is mushy. It’s a huge waste of ingredients and time, especially since I made it three times to make sure it wasn’t me just messing the recipe up. I’m not trying to bash you but I made this because I saw so many wonderful reveiws and wish I hadn’t wasted my time and money. I recently made this and it was WONDERFUL. Very easy to make, not complicated to assemble, set up beautifully, and tasted out of this world. Made me look like a professional baker!! And the cream cheese no-churn ice cream?? YUM YUM YUM!!! 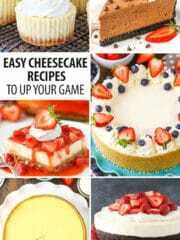 I can not wait to try every other one of your recipes!! So glad to hear that, Jennifer! I love this one and am so happy you did too! I made this a week ago and it was delicious!! Didn’t change a thing and it was a huge hit for my cousin’s birthday party. I did, however, use a springform pan with a parchment lining and the cake came out with little divets where the paper crumpled so I definitely recommend using a cake collar for a smoother cake for anyone looking to make this! Thanks for the recipe! When you add the Finlay top layer of ganache (that dribble down the sides for effect), will it melt the edges of the ice cream cane and misshape it? It doesn’t usually do that for me. But you’ll want to make sure the cake is fully frozen and work relatively quickly.